When it comes to the design of identity credentials, the campus card tends to take a more pragmatic approach than its state or federal-issued colleagues. In particular, most campus cards seem to avoid the use of holograms and other sophisticated laminates and card overlays. While these more advanced card design features may not yet be common in the university setting, the addition of holographic elements creates a more secure credential that can better stand up to fraud and counterfeiting attempts. ColorID’s corporate marketing manager, Mark Degan explains that a university has options when it comes to adding a holographic laminate to its campus card. One option is to add the hologram to the cardstock itself via surface holographic foil stamping to the card surface, he says. 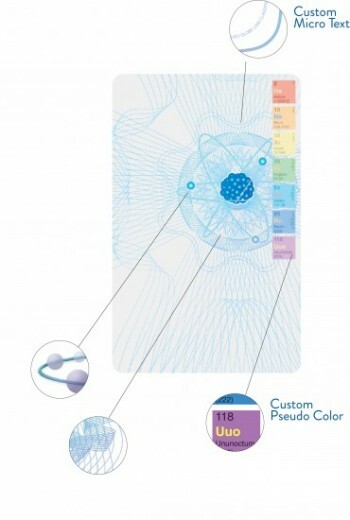 Another options sees an embedded hologram applied to the clear overlay portion of the cardstock. 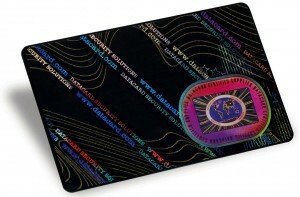 Finally, a custom holographic laminate can be used in desktop dye-sublimation card printers or transfer film could be utilized in a retransfer ID printer to apply a hologram to the card. I know what you’re thinking. What’s it going to cost me? In terms of price, Degan says that the addition of a hologram to cards or overlays could add anywhere from an extra 20-75 cents per card. Cost also increases depending on the sophistication of design. If a university wanted their own custom hologram, Degan says the supplies would cost 10-20% more per roll and would include an origination fee for registering the hologram design. There could also be an order minimum attached to these credentials. In order to justify the additional cost of holograms and other card design features, it’s vital to first understand what it is you’re paying for. There’s a reason that holographic elements appear on secure, official identity documents. Simply put, advanced graphic elements make it more difficult to counterfeit a credential. If a credential that features holographic elements were to be forged, the fake would still be unlikely to pass a visual inspection. “As long as your staff that is checking the cardstock knows what to look for, your cards will have next to no successful forgeries,” says Degan. Degan explains that add-ons like UV ink, custom overlay patterns and foil stamps can all be replicated to fool an untrained eye. “True holograms that feature guilloche patterns, micro-text, 2D features and nano-text are nearly impossible to duplicate, particularly if those checking the IDs know what to look for,” he adds. As Degan sees it, anyone can utilize a UV panel from an ID printer, or a metallic foil ribbon to make an official looking ID card, but ultimately it comes down to who checks the IDs. In addition to the presence of a hologram, however, there are further subtleties that can be added to enhance design security, as well as weed out the forgeries. Secure elements visible by anyone. These include 2D holograms, guilloche patterns, animated effects, flipping images, ghosting image and pseudo coloring. Secure elements that a trained person can locate with the naked eye or inexpensive tools. This level includes elements such as micro-text that is readable only via 8x, 10x and 12x magnification. Secure elements that can only be deciphered using forensic equipment. This level employs elements such as laser converted text or guilloche patterns that are revealed with lasers and micro-text that is above 3,000 DPI. These elements can only be detected by Optical Variable Devices or microscopes. In Degan’s experience, most universities don’t opt to add holograms or advanced security features to their current campus cards. “But each year we do have more and more universities add the security component after understanding the benefits these elements can add their the cards,” he adds. One university that has employed holograms on its campus card to great effect is Clemson University. The Tiger OneCard features Datacard’s Duragard OptiExpress 0.6 mil Custom Laminate along with a registered security design specific to Clemson’s brand. While the implementation of a custom, registered hologram is the pricier route, Robbins insists that the cost to Clemson’s card issuance process was nominal. Robbins and the folks at Clemson have implemented the hologram to great success thus far, making a case for others to consider the added layer of card security.